You searched for which does not fit your . We've redirected you to 724-540, which has the proper fitment. 3X-Small 36" 34" 19" 25 1/2"
2X-Small 38" 36" 19 1/2" 25 3/4"
X-Small 40" 38" 20" 26"
Small 42" 40" 20 1/2" 26 1/4"
Medium 44" 42" 21" 26 1/2"
Large 46" 44" 21 1/2" 26 3/4"
X-Large 48" 46" 22" 27"
2X-Large 50" 48" 22 1/2" 27 1/4"
3X-Large 52" 50" 23" 27 1/2"
4X-Large 54" 52" 23 1/2" 27 3/4"
5X-Large 56" 54" 24" 28"
When you choosing your size, please add two inches to your original measurements. This jacket is heavy duty and nice looking, appears to be well made. But even after adding the extra inches in sizing, this jacket is too small, even with the liner removed. So back it goes. good jacket just need a little cold weather to use it. Every bit as good as I had hoped. J&P continues to provide good products at good prices. Good fit. Good grade heavy leather. Substantial hardware. Quality construction. I'm very happy with it. first off, this jacket looks great. it is really solid. the only gripe i have with it is that it fits me rather awkwardly. I'm a skinny guy, I'm 6'1 and about 175 lbs. i don't have big upper body, thats a lengthy way of saying I'm a shrimp, no muscles really in the arm and chest department. so this jacket has A LOT of room in the sleeves in the upper arm and the shoulders. id like a more fitted jacket so i had to send mine back. the jacket is pretty warm and looks really cool which is why i fought with myself before deciding to send it back and continue to look for the perfect leather jacket. “Kewl” look’n jacket, quality is excellent, price is outstanding and one may expect to pay $100+ more for this jacket. 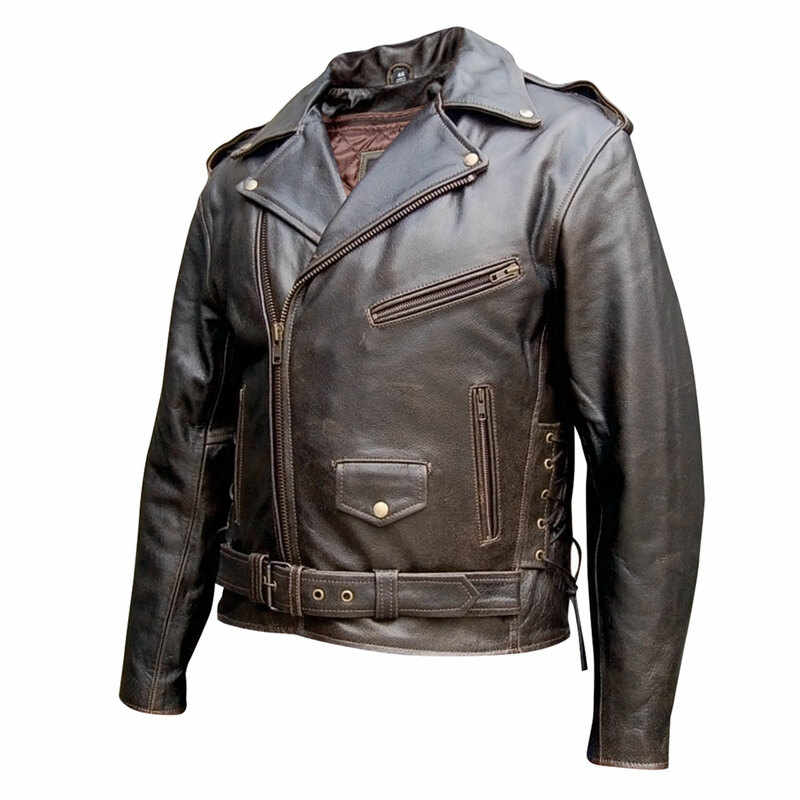 This is “Buffalo Leather” and not light weight, but thick, maybe not for warm days. The sizes run small, I wear about 38/39 ordered a 42 and fits fine (plus it has a zip out liner). My only concern is; for a “distressed” look, it is too “shiny” for me, guess I will need to do some more “distress’n”.